Whisper Creek Golf Club is about a 45 minute drive north from where I live, but easily worth the trip. It’s right in the center of a Del Webb community, made up of single story retiree homes to larger, family homes. 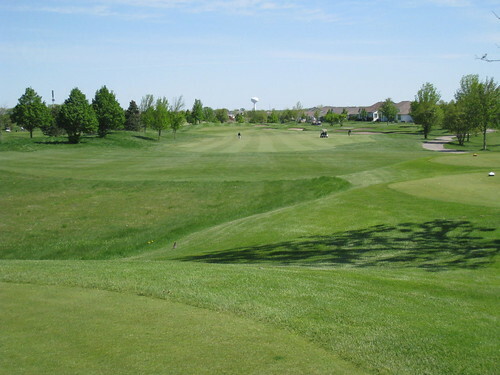 The benefit of this type of facility is that it is master planned, so the homes don’t really get in the way of the golf. Since it was planned from the ground up, the flow of the course is also quite impressive. You drop your clubs at the bag drop, and take them to your cart (or someone helps you). 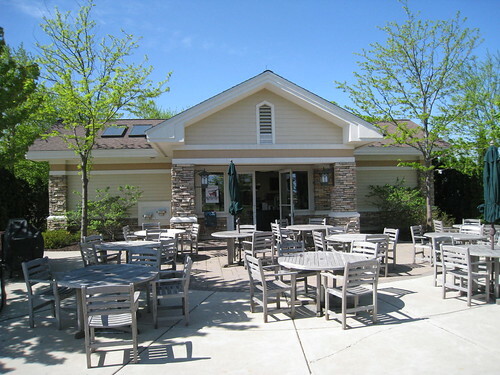 You step in side to pay, and when you step outside, you’re immediately facing the driving range, with a snack bar and a very large putting green to you left. After picking up a coffee at the snack bar, you can hit a few balls on the range, and move your cart about 10 yards to the putting green. After warming up the putter, you drive about another 15 yards to the starter, and finally end up on the first hole. This gentle, relaxed flow is noticeable, and the perfect way to start the round. The course starts with a gentle par 4 (or so it seems). The prevailing wind is left to right (and the day we played, it was significant). 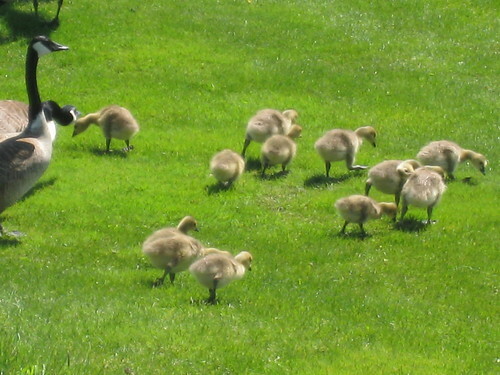 The only issue that arises is if you slice a little, and the wind takes it to the right side of the fairway. 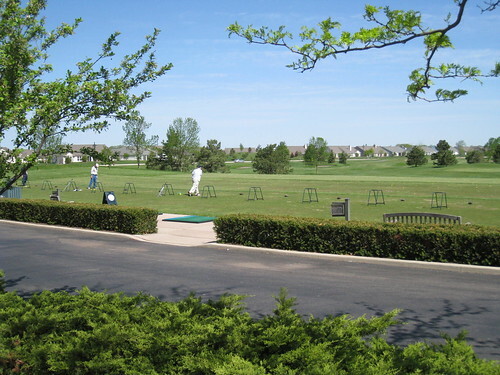 It borders the driving range, so pay close attention to the ball before you hit it! This also leaves a tough approach to the green, forcing you to go over a bunker. The 4th hole is a great design, and I’m actually glad that they decided to leave the large trees on the left side intact. It may have been very easy to remove them, but it adds a layer of difficulty to the hole that could’ve easily been avoided (good for you, Whisper Creek designer!) The tee shot is crucial; you have to be on the right side of the fairway to have any sort of an approach to the green. 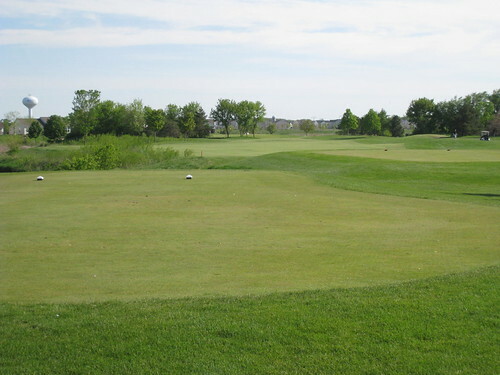 In addition, there’s water bordering the right side of the fairway, very tall grass on the right, and a creek running through the fairway ¾ of the way to the green. Like I said, it is very tough. In the following picture, the green is behind the group of tall trees in the middle. 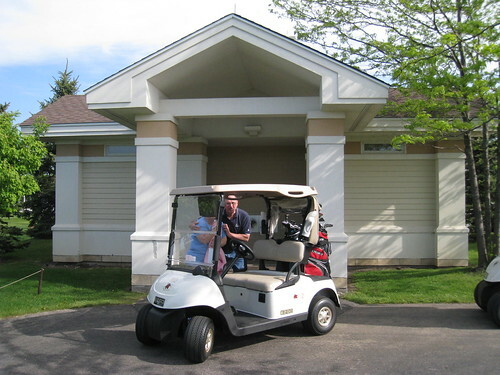 Just before reaching the 5th tee, one of the two (plus the halfway house) on-course restrooms is available. 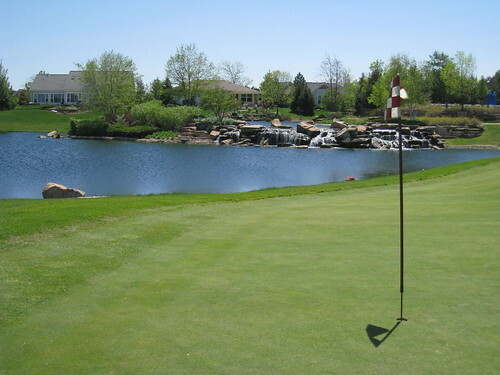 I often play golf with my wife, and have come to understand the value of clean, permanent facilities on the golf course, and Whisper Creek Golf Course is no slouch. The restrooms were clean and abundant (3 total through 18 holes). At times, this is the decision-maker as to what course we’ll be playing. Good job Del Webb! Here’s a picture of the facility, with my Dad and wife screwing around in front of it. 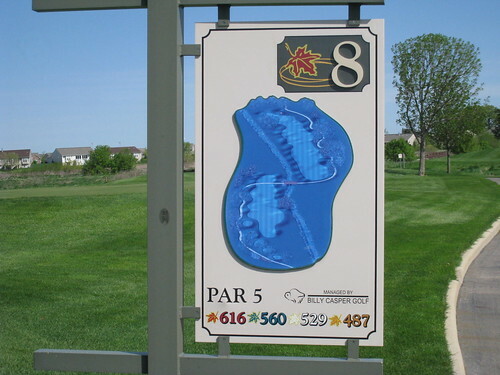 The 8th hole is one of the more interesting par 5’s I’ve seen. It’s plenty long (616 from the tips), but most of the distance is after the tee shot. To make it easier to understand, here’s a shot of the tee sign. So the tee shot may only be 250 or so before you run out of fairway (and it tapers at the end, so don’t push it), making this a definite three shot par 5. The second shot should be all about placement, and the third should be precise, as the green is surrounded by trouble. Par here is great. As you make the turn, you’ll have the opportunity of stopping at the halfway house (which is the same as the snack bar mentioned earlier.) The restrooms are very clean, and the snack options are expected. There’s also room to sit outside after your round and have a snack, and watch golfers pass by and the players on the range. 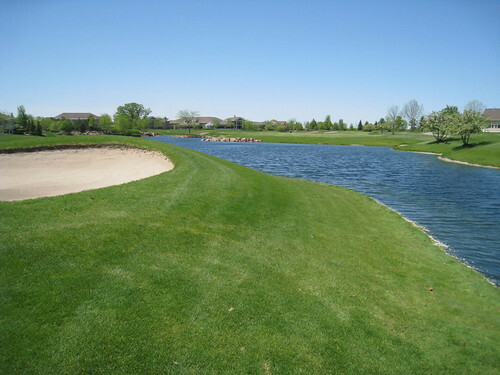 It is almost impossible to clear the water on the tee shot, so plan on laying up but remember, the fairway slopes down to the water, so take one or two less on the tee shot (tough to do on a par 5, but you’ll thank me later.) The second shot is best placed left of the bunkers, but the fairway gets very thin in the preferred landing spot, so decide if you’d rather risk a shot and have 100 yards in, or have 150-160, and lay up before the bunkers. If you look at the image, there are bunkers on three sides of the green, so a crisp shot is required. 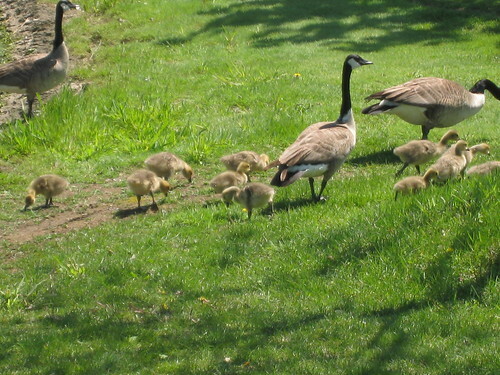 One of the best things about playing golf is the opportunity to see wildlife, and Whisper Creek is no exception. Here’s a shot taken from behind the 16th green. I love this stuff. 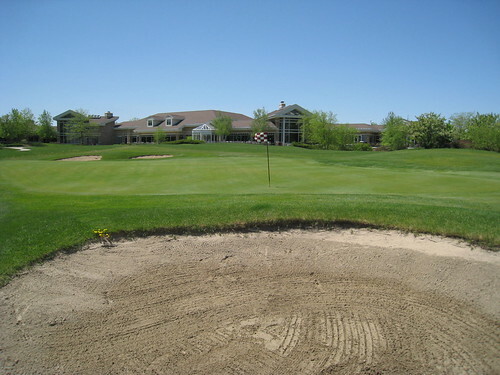 The golf course finishes on a par 5 that works its way back to the clubhouse. Again, the fairway is cut into sections, requiring a second with a carry over water. Here’s what my second shot looked like. As long as you stay out of trouble on your tee shot, the second over water isn’t too difficult. 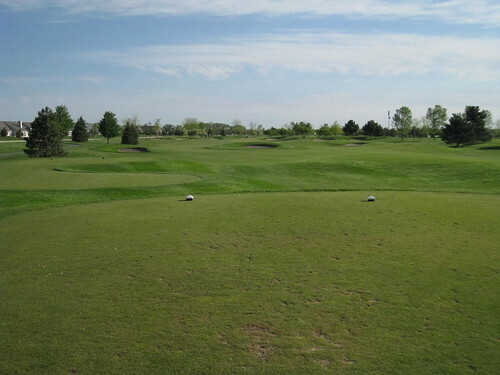 The fairway is fat enough that you’re allowed to pick a distance for your third without too much trouble. Don’t leave your approach to the green short; you’ll end up in the bunker like I did. At least it made for a pretty, final picture. The pace of play was very good, and we finished in 4 ½ hours, which is very acceptable, especially for a Saturday morning. In addition, they don’t have permanent tee times on Saturday mornings yet (although they may be going that direction very soon), so it’s one of the few quality courses you can call on a Wednesday afternoon and still get a decent tee time for Saturday morning. Finally, if you watch their web site on a regular basis, they usually keep the “coupons” section updated, so always check prior to making a tee time. 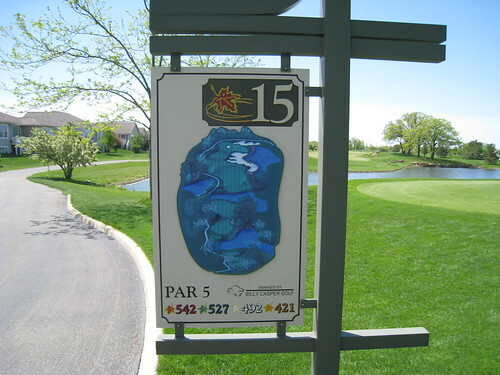 I’m sure I’ll be playing this course again in the future, because it’s always a challenge (with or without the wind), the price is very reasonable based on the quality of the facilities and greens, and it’s relatively close to my house. Give it a shot, and let me know what you think in the comments.